At Greenco Gardening we care about environment! All our products are made of environment friendly materials. 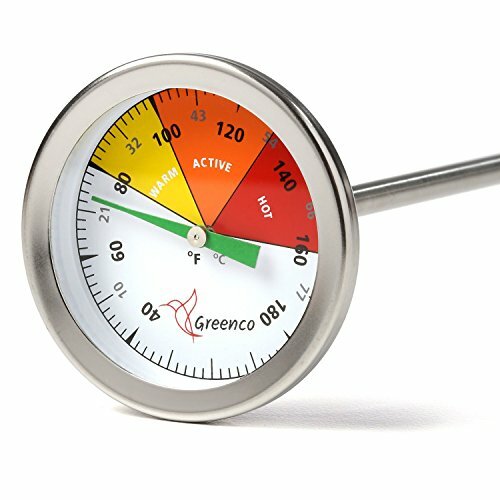 Greenco Gardening Premium Compost Thermometer lets you know the temperature and health of your compost pile. Simply place the stem into the middle of your pile to get an accurate reading. Activate your compost: 'Activators' can be added to your compost to help kick-start the process and speed up composting. Common compost activator materials are: comfrey leaves, grass clippings, young weeds, well-rotted chicken manure. A moveable fresh ground: The soil beneath a compost bin becomes enriched as nutrients filter down with successive waterings. You can place your bin on a plot of earth which you plan to use for a future vegetable or flower bed, or fruit tree. Each year, you can move the bin to a different area; you'll get a double benefit - the compost from the bin, and a bed of nutrient-rich soil ready for new plantings. Minimise unpleasant odors from your compost pile: This can be a concern in urban and suburban areas with small lots and neighbors living close by. Odors can be reduced, or eliminated, by following two practices: first, remember to not put bones or meat scraps into the compost; second, cover new additions to the compost pile with dry grass clippings or similar mulch. Adding lime or calcium will also neutralize odors. If the compost smells like ammonia, add carbon-rich elements such as straw, peat moss or dried leaves. If you have any questions about this product by Greenco Gardening, contact us by completing and submitting the form below. If you are looking for a specif part number, please include it with your message.